Marbles are one of the oldest known toys and are known to have been played with in the pre-Christian Rome. It is a simple toy, but one that has stood the test of time, going in and out of fashion throughout the ages. Originally made in the late 19th century, these marbles were found on the banks of the River Thames by a professional 'Mudlark'. This set consists of 197 different coloured and sized marbles, all with internal swirls in shades of green, red, white, blue, brown, orange, yellow, and black. 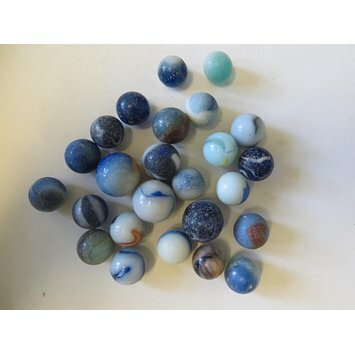 These 197 marbles are all made from glass and stone, although all of them have internal swirls in different shades of blue, green, white, blue, red, brown, yellow and black. Some of the clear glass has taken on the colour of the internal swirl making them appear to be different coloured tinited glass. The surfaces are slghtly chipped and scratched, presumably from play. There is also evidence on ingrained dirt from their time in the Thames. Diameter: 2 cm largest marble approx., Diameter: 1.5 cm medium sized marbles approx., Diameter: 1 cm smallest marble approx. 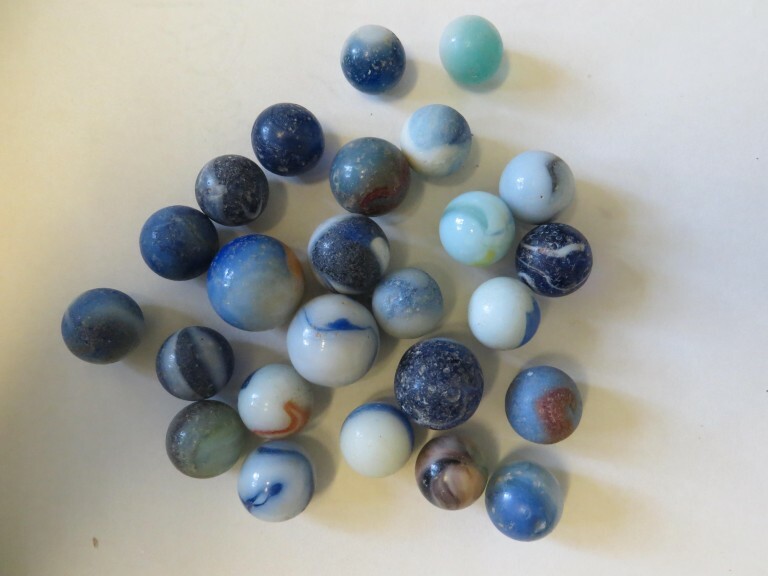 A set of 197 different coloured and sized marbles, such as blue & white swirls, white, yellow, orange & white, blue, pearlised, white with red & brown, multi coloured, stone, black & white and green and white, made in England in the late 19th century.